Buy 1 - 5 for $40.99 ea. Buy 6+ for $35.99 ea. The Watts WCBCFF20 5 Micron 20" Coconut Carbon Filter Cartridge is a 20" L x 4 1/2" W coconut carbon block water filter replacement cartridge used primarily in whole house water filter systems to reduce the bad taste and odor of chlorine as well as many common impurities such as sediment, dirt, turbidity, limescale, rust, sand, silt, and more. The WCBCFF20 water filter uses advanced coconut carbon filtration technology to maximize carbon capacity and maintain a low pressure drop for more efficient water filtration. 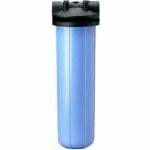 This Watts 20" coconut carbon block filter is a compatible replacement water filter cartridge for similar 20" filter brands including Pentek filters, Ametek filters, Culligan filters, US Filter filters, Ace filters, American Plumber filters, Bruner filters, Plymouth filters, Pentair filters, SpringHouse filters and other name brands. 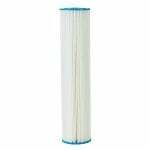 It will fit all whole house filter housings which use a 20" x 4.5" water filter replacement cartridge. 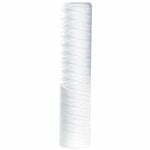 This is a replacement filter for the Springhouse US70793, WCBCFF20. This system was previously manufactured by Ecoquest. 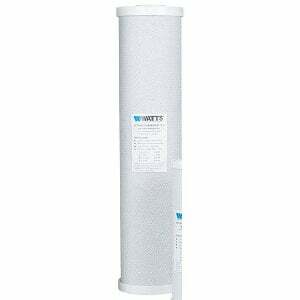 More information about the Watts WCBCS20 water filter can be found here.